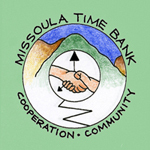 Empowering our community through equality of time exchange. Thank you for applying for membership, your application may take a few days to process. Thank you for your patience. We look forward to exchanging with you soon! 91 MEMBERS. 2,823 HOURS EXCHANGED.